Each month, our Classic box showcases dyers' unique and colorful yarns. In October, we included a skein of natural undyed 100% merino yarn to accompany the rich hues from Carol Martin at Farmhouse Yarns. Our featured patterns showcased some amazing colorwork designs to feature the contrast but this month also brings the opportunity to play with color yourself. You don't need professional dyes and equipment to start experimenting with color for custom dyed yarn. There is plenty of dyeing potential found right in your kitchen! Natural dyeing is a great way to explore the multitude of combinations you can achieve with some plant material. Natural dyes require three things: dye material, heat and a binding agent called mordants. Natural dyes use metals to help the dye bind to fiber and create brighter, deeper colors. There are plenty of metals you can use and each will yield a different color with the same dyestuff. Alum (powdered aluminum) is the easiest to work with and can be used with just about everything. Dharma Trading is a great source for mordants and dye materials. I'm using but onion skins for my samples, which are a easy way to get started since they require very little preparation, are easy to collect and are very forgiving to a beginner. It doesn't take much to get started, but buying some dedicated dyeing tools will be helpful once we move beyond the basics. I use an inexpensive enamel pot and metal slotted spoon for dyeing and collect the skins from onions whenever I cook. The skins keep best stored in a paper bag until you have enough to make dye. To beginning, I split a full skein of Andy's Merino II into one ounce mini-hanks, loosely tying the hanks to avoid tangling but allowing the dye to penetrate under the ties. Soak the yarn for a least an hour in cool water. Yarn hanks, tied and soaked before mordanting. When using metal mordants, use a dedicated dyeing pot and utensils and take care not to inhale the powder while pouring. Measure out the alum, about 1.75tsp per 4oz of yarn, and dissolve in hot water. Fill the dye pot with plenty of cold water and stir the mordant mixture in. To improve color even more, you can also use cream of tartar dissolved in hot water before adding the alum. Once the alum is added, squeeze the excess water from the soaking skeins and place into the mordant pot. Heat the water slowing to a gentle simmer for one hour, stirring the yarns around every so often to make sure it aborbs the mordant evenly. After an hour, turn off the heat and let it sit in the water until cool. Since I'm not using cream of tartar, I let my yarn soak in the mordant overnight. Once its cool, rinse in cold water. While my yarn is sitting in mordant, I started the dye bath. With onion skins, you'll need half the weight of the yarn in dyestuff at minimum. With 1oz of yarn, I used .5oz of onion skins. I made up a sachet by stuffing the skins into the leg of an old pair of tights, cutting and knotting the top. Fill a pot with water, add the bag of skins, and cook for at least an hour. The longer you cook the dye and the more dye material you use, the deeper the color will be. With wool, you want to cool the dye before adding yarn to prevent felting. Cooking the dye bath. On the left, yarn soaks in the mordant pot. Once the yarn is ready, remove the sachet from the water and add the yarn. Add more water to completely cover the yarn. The amount of water in the pot won't effect the dye's potency but you want to make sure the yarn to move around freely to help it absorb evenly. Like the mordant, you want to slowly heat the dye to a gentle simmer and stir occasional. Then just wait until the yarn is a color you're happy with! Both my samples sat in a dyepot for about an hour. Let the water cool, then remove the yarn, rinse under cool water to remove any excess dye and let dry. 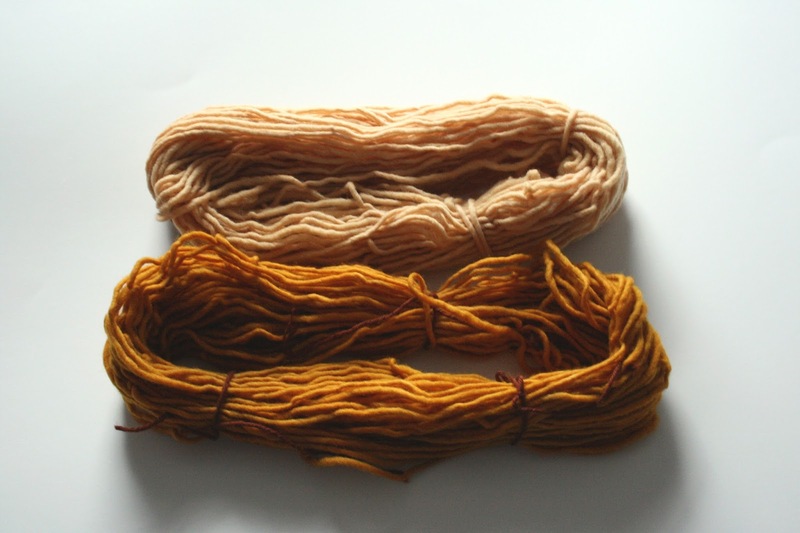 The top skein was dyed without any mordant and ended in a soft golden color. As you can see with the bottom skein, the mordant process allowed a much deeper yellow-orange color. The mordant skein will also be more color-fast and less prone to fading. The sky is the limit with natural dyes! Try out different materials, such as flowers, berries, nuts or tree bark. My favorite resource is Wild Color by Jenny Dean, a great book with lots of techniques for making dye and a great guide to the colors plants can make. Next week, we'll do some more kitchen dyeing with food coloring! Curating each Yarnbox is such a joy for our team. That joy is amplified every time a member receives and opens their box of yarn love. Members all over various social medias share their unboxings with us and we love seeing each and every one of them! On Instagram, Yarnbox member @knottykitten shared her unboxing of October's featured yarn, Andy's Merino II from Farmhouse Yarns. Share your Yarnbox unboxings with us! Tag us on your choice of social media sites and show us the extreme excitement you feel with each Yarnbox! Find us on Ravelry, Facebook, Google+, and tag and follow us on Instagram @yarnbox and Twitter @MyYarnbox. With the changing of seasons comes the opportunity to create those winter-wear items like woolen hats, cowls, scarves and mittens. Our October Classic box goes a long way in bringing inspiration for these projects that will keep us warm when the weather turns from summer lovin' to winter wonderland. In October, our boxes were stuffed with three hearty skeins of Andy's Merino II from Farmhouse Yarns. Andy, whose adorable sheepy face is pictured on each tag, is one of Carol Martin's sheep that living on her farm. Carol's Farmhouse Yarns are made from her sheep's wool on her Connecticut farm as well as fibers from other local farms giving you a true American made yarn. Each box came with two skeins of colored yarn and one skein of natural yarn at 175 yards each. Andy’s Merino II is 100% merino wool, single plied and considered between worsted and aran weights. Carol carefully vat dyes this yarn which gives each skein its rich color. Each skein is a little different, though, depending on where in the vat it gets dyed (bottom is more saturated than those at the top) giving it a slight variegation in this semi-solid tone. With no dye lot, each skein is truly unique. While many chose to work with the natural skein, some others took an opportunity to dye it. Next week, we'll talk a little bit more about that. Our project designers in October created quite a frenzy among our members with their gorgeous designs. The warm and cozy Koselig Capelet by Taylor Tengelson was the go-to pattern for crocheters. There wasn't a color it didn't look good in. Laura Birek designed this Idyllwild hat pattern that combines a beautiful braided brim and brioche cap for a warm and cozy hat for those cold winter months. It brought such great inspiration to our knitters that we started a Brioche Learn-A-Long thread on Ravelry so everyone could help and cheer each other on with their projects. Join us on Ravelry on our October Classic 2015 thread and share with us your projects using Andy's Merino! Thinking of subscribing after reading this post? Click here to get a Yarnbox Classic subscription of your own! So there's someone in your life you know loves to knit or crochet (or maybe both) and you want to give them a gift this holiday that will make them squeal with delight. We've made that an easy job for you this year with Holiday Yarn Gift Boxes from Yarnbox! Choose from our selection of specially curated Yarnbox sets priced at $25, $50 and $100 from three dyers we know you'll love: Sweet Georgia, The Yarns of Rhichard Devrieze, and Anzula. You get to pick the color for your box and each box includes patterns. Only available for a limited time while supplies last! Order yours at https://yarnbox.com/holiday/ today! Orders begin shipping December 1st to arrive in time for the holidays. Our newest quarterly subscription box brings so much excitement to our members and all of us here at Yarnbox. In July, Artyarns gave us three mini skeins of Regal Silk plus a mini skein of Beaded Silk Light. In October, we could feel all the squeezing being done by our members with the lucious merino wool and cashmere blend of Big Merino Cloud. Perfect for those fall and winter accessories, Big Merino Cloud is a super soft combination of 80% merino wool and 20% cashmere that makes you smile when you feel it. Great to work with, even better to wear! Iris Schreier and Artyarns offered us three rich color pairings for our Plus box that evoke the colors around us in the autumn season. The first, Mossy (pictured first above) reminds us of when the leaves first reach the season: still with their color but becoming richer in anticipation for colder temperatures. Fungi (pictured just above) moves us farther into the season when the leaves turn their rich brown and orange shades that we only get to see for just a short time till they fall from the tree limbs. And finally, we have Morning Frost (pictured below) that signals to us the end of the season and the approach of winter. All perfect times to wear your Big Merino Cloud accessories! What makes Yarnbox Plus+ Artyarns unique is that these color parings from Artyarns are exclusive to Yarnbox and can only be purchased through your Plus+ subscription. Also an exclusive treat for this box is a custom pattern from Iris Schreier! Iris's Autumn Arbor Hat and Mitts pattern enhances the true depth of these colors in each skein. Keep an eye out in mid-December for your next opportunity to subscribe to this box and join the fun in this exclusive Yarnbox subscription featuring wonderful treats from Iris Schreier and Artyarns! Click here to get a Yarnbox subscription of your own! October Socks Review: Coopknits Socks Yeah! What happens when you take a favorite knit sock designer and pair it with her own brand of sock yarn? You get Socks Yeah! from Rachel Coopey and Coop Knits. And all of us Yarnbox members were the first to get to play with this new yarn line (YAY!). It was quite the honor to launch this Rachel's new yarn line in October and bring a brand new yarn to our members. The 75% fine superwash merino wool and 25% nylon is light to the touch and easily glides across the needles making for a divine sock knitting experience. We couldn't send out yarn from Coop Knits and not send out another wonderful Rachel Coopey sock pattern! There is no wrong color to go with this Tavia sock patter. The cables within the pattern give a fun texture to this smooth, heathered yarn. We love seeing your projects both finished and work in progress! Share them with us on our Ravelry group and on Instagram @yarnbox. Click here to get a Yarnbox Socks subscription of your own! We look forward to sharing all of the excitement of each Yarnbox shipment with you! © Yarnbox Inc, 2015. Awesome Inc. theme. Powered by Blogger.